Making My 7th Doctor Costume: Screen-used McCoy hat and scarf -FOR SALE! This hat is now SOLD!! 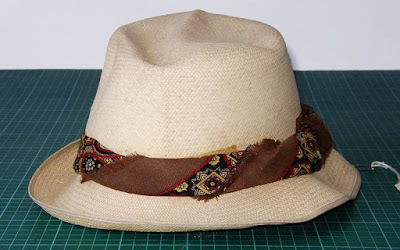 I am putting on offer an ORIGINAL screen-used panama hat worn by Sylvester McCoy in Doctor Who! Originally sold as Lot 91 at the big Doctor Who auction held on February 24th 2010, it consists of the Hat, a Red Hanky, a very rare Brown Hanky and part of the Purple/Burgundy Scarf briefly worn by Sylvester during his Costume Transition Scene in Time And The Rani. The Hat is a Locke & Co hat, and to be honest is in pretty poor condition. It was believed to have been worn during the stunt fall into a stream during part of Silver Nemesis (see below), from which it didn’t recover! The Red Hanky has clearly been used around The Doctor’s hat, as you can see where the design has faded on the folded edges. In the folds the print quality of the hanky is near perfect. It is knotted, and fits around the hat. The Brown Hanky was erroneously on the hat when it was sold at Bonhams (given that the hat was last used in Silver Nemesis). It is a full quarter square of the scarf used. The edges are deliberately un-hemmed and frayed – but in a nice way! There is no fading or damage from its use. This hanky was attached with double-sided tape, as it does not quite reach around the Hat, which leads me to think it was probably one of the hankies that were hanging out of McCoy’s jacket pocket. The hanky was carefully removed from the hat, and the double-sided tape (used during its time on display at Blackpool) has been cleaned away where possible. This is an bit of an odd-ball item in the set, and its connection wasn’t immediately obvious, given its length. It featured in Time And The Rani during McCoy’s Costume Transition Scene. In it he briefly wears the costumes of a number of his predecessors, including Jon Pertwee, Patrick Troughton, Peter Davison and Tom Baker. The scarf was much longer than seen here, and was used as a substitute for Tom’s original. It is not known as to why the scarf was cut in half, but I have heard of another collector who also owns an equal length. Maybe one day they will be reunited! This is a near unique opportunity to purchase not one but FOUR original, screen-used items from the Seventh Doctor’s costume. Screen-used McCoy hat and scarf -FOR SALE!